After 3 years of publicized production and post-production difficulties bringing this picture to the screen which caused much gossip as to the quality of film it was all worth the wait. In fact, Where The Wild Things Are is better than we could have hoped and exactly the kind of idiosyncratic auteuristic picture we wanted from Spike Jonze. The notion of Jonze adapting Maurice Sendak’s 1960's children’s book was certainly a risky choice, potential for both triumph and complete failure. After all “Being John Malkovich” and “Adaptation” were both phenomenally original films, but this story NOT a Charlie Kaufman script, but a sparse 19-page picture book, with a wide open canvas for adaptation. The finished film is a courageous work of art, a wholly unique experience, meeting and exceeding our high expectations. Under anyone’s else’s watch this film would have been turned into an fantasy extravaganza, replete which mondo special effects, overly designed fantasy worlds, fantasy creatures and Pixar/Disney sappy comedic tones. After all, it’s a familiar story, a troubled and lonely child retreats to his dreams where he finds a fantastical world of monsters, of which he makes himself king. The actual book is only 19 pages, and only about one sentence per page, a very sparse jumping off point for Jonze and his co-writer Dave Eggers. The film version expands on the opening pages of the book, showing us the lonely existence of Max a rambunctious and imaginative 11 year old who is too young to hang out with his newly pubescent sister and who receives little attention from her newly dating single mother. As a result Max has his imagination to retreat to, and when his mother chastises him for standing on their kitchen table proclaiming himself a king, he runs away from home. His flight transforming him not unlike Dorothy in Wizard of Oz, into his own fantasy world of his subconscious mind. 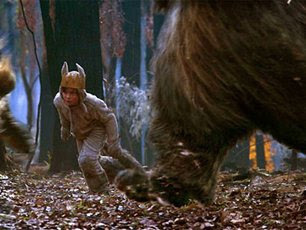 Max finds himself in a world inhabited by giant beasts, or ’Wild Things’ as the title suggests. Max, dressed in his wolf pyjamas, plays the role of a king in order to convince the beasts not to eat him. He befriends their leader Carol (James Gandolfini), a volatile personality who is as innocent and congenial as he is on the edge of destructive violence. Over the course of the next few days Max explores the island and caroses with his new beastly playmates satisfying all the inhibitions and desires he couldn't express at home. The joy of the film lies in Jonze’s steadfast determination to root the story in reality. His choice of using the Jim Henson Creature Shop ’old school’ designs is retro-inspired. His wild things are a seemless blend of old fashioned men in furry suits and carefully-used and near-invisible computer effects. But its the techniques of the past which have been obsolete for over 15 years now that adds the real-world organic quality. It's just one aspect of Jonze’s remarkable ability to retain the simplicity of the story. While there’s little plot in the book there’s just as little going on in the film. Yet it sustains its 1 hour, 40mins running time admirably. Jonze is in tight control of his tone - a melancholy sense of reflection. While the action in the story is generated from Max’s childlike imagination, it's told through the eyes of Jonze, the adult. His direction of the voice actors is inspired, favouring natural, understated voice cadence and dialogue over jokes, punch lines and all traditional template dialogue we hear in kids flicks. The characters are simple, so are the words coming out of their mouths, but the way the lines are read feels sophisticated and complex. Jonze’s camera work is typical of his style. Once again his favourite lensman, Lance Acord shoots the film handheld and natural without it feeling 'shaky'. Carter Burwell’s touching score, which Jonze said, was influenced by listening to Arcade Fire, finds completes the tonal consistency. And so this is how Jonze achieves his vision, an auteur sensibility which fits in perfectly with his two Kaufman films. “Where the Wild Things” is a kids film made for adults, which, unfortunately means it never ever had a chance to make the big bucks its Disney conpatriots exploit for their adaptations. Though it will not make $100million dollars at the box office, the film is a success, a great success. While children most will not be able to comprehend the dark and melancholic tone there’s no doubt Jonze’s film will last much longer than ‘Cloudy With a Chance of Meatball” or ‘Monsters Vs. Aliens”. Glad to hear a good review. I had heard it wasn't that great. More for adults? Can I bring an 8-year old? There's nothing in appropriate for an 8-year old, but he/she might get bored.